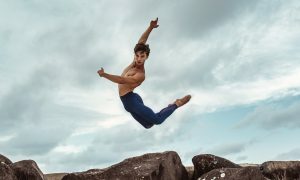 Two of Stuttgart Ballet’s rising stars, Daniel Camargo and Elisa Badenes, journeyed to Melbourne to perform at The Australian Ballet’s 50th Anniversary Gala late last year. 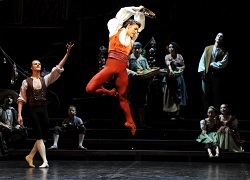 They performed the first piece of the night, choreographed by Stuttgart Ballet’s own Demis Volpi. It was a challenging contemporary piece that highlighted the dancers’ exquisite bodies and technique. 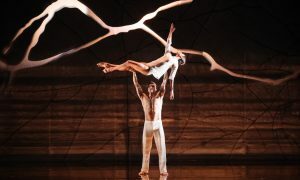 Ultimately though, it was their performance later in the evening of the Don Quixote Act III pas de deux that blew the audience away and exhibited why Stuttgart Ballet is one of the world’s greatest companies. Dance Informa caught up with Daniel and Elisa upon their return to Germany following a tour to China with Stuttgart Ballet. Tell us a little about your dance training. I began my dance training in my native country Brazil at the Guaira Ballet School in Curitiba. In 2005, I participated in the Youth America Grand Prix and met Tadeusz Matacz, Director of the John Cranko School, who invited me to come to Stuttgart. At the John Cranko School I studied with Petr Pestov, a great teacher who influenced me very much. In 2009, I joined the Stuttgart Ballet. Elisa Badenes of Stuttgart Ballet in Don Quixote. I started at age 11 at the Conservatorio Profesional de Danza de Valencia in my home country of Spain. My teacher was Rafael Darder. In 2008, I participated in the Prix de Lausanne and received a scholarship to the Royal Ballet School where I studied for one year. In 2009, I auditioned for the Stuttgart Ballet and joined the company. What was it like to perform for The Australian Ballet? Amazing. The entire company was very nice and welcoming. Of course it is always interesting to see how different companies work. I found the Australian Ballet to be like a big family with lots of positive energy. It was very nice and a lovely experience. Everyone was working so hard and it was clear from the atmosphere that it was a very important evening for the company. The staff and the dancers made our stay really enjoyable and comfortable. What did you think of Australia and of the dancing? Melbourne was fantastic and in general the country reminded me of the USA in terms of the “wide open spaces.” Everything seemed very new and the mix of architectural styles was impressive. The people are very friendly. I always wanted to travel to the “other side of the world,” so this was a dream come true for me! Everything was exciting. We really loved the people. Unfortunately we didn’t have much time to travel around but when we left we had a very positive overall impression of Melbourne. The level of the dancers was very good and it was especially nice to see how supportive the audience is of the dancers. So far, definitely the full length Don Quixote! It’s hard to say…. I just love all the pieces I have danced so far. Do you prefer traditional ballet or modern pieces? Both. I love the traditional pieces, the classics, as well as contemporary works. It is the most challenging to be involved in the creation process for brand new works, but it is very exciting. I simply can’t choose because the biggest pleasure is to be able to do both. I can’t imagine dancing just classical or just modern. I love dancing different styles and different works. That is one of the big pleasures of our job, that we are changing roles, characters and styles. What would you do if you weren’t a dancer? Sports – soccer, skateboarding or snowboarding. I could imagine studying, but it would surely involve the arts or a profession where one has contact with many people. Top photo: Stuttgart Ballet Soloists Daniel Camargo and Elisa Badenes. Photos courtesy of Stuttgart Ballet.